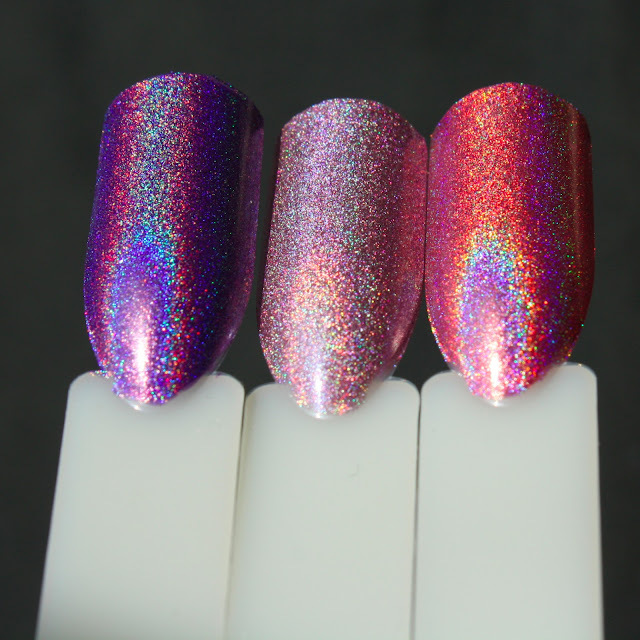 Today I'm comparing some of the holo polishes in my collection to the newly released Color Club 2013 Halo Hues. I was also just super excited to use my swatch sticks BUT I'm sure most of you will find this post helpful! And just to warn you - this post is a little photo-heavy! First up, I have Color Club Beyond vs. Layla Flash Black. Beyond applied in 2 easy coats, while Flash Black applied in 3. It's easy to see that Beyond is closer to a truer holographic black, while Flash Black is more charcoal. However, Flash Black has a much stronger holo effect than Beyond. In the following photos, Beyond is on the left while Flash Black is on the right. The first photo is in indirect sun, and the following are in direct sun. Up next is Over the Moon. Here, I've compared it with NailNation 3000 Wow A Doodle #853 and UP Colors Verde 360. Right off the bat, Verde 360 has a fairly weak holo flame compared to the other 2. It is also lighter and closer to teal. I found that Wow A Doodle #853 and Over the Moon were VERY similar, the only differences being that Wow A Doodle was smidgen darker, the holo effect was a smidgen weaker, and it has small pink flakies throughout. Over the Moon is on the left, Wow A Doodle #853 in the middle and Verde 360 on the right. The first photo is in indirect sun, and the following are in direct sun. 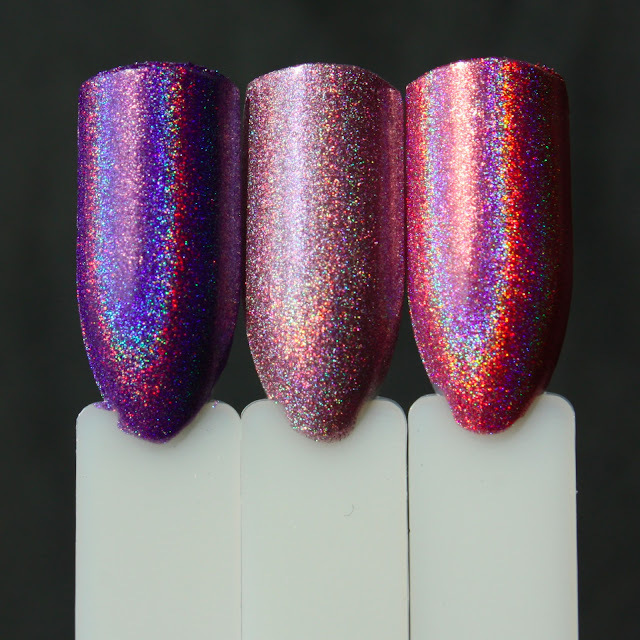 I decided to compare Color Club Eternal Beauty (the purple holo) and Miss Bliss (the pink holo) to the closest shade I had in my collection: UP Colors Laser Lilas. Laser Lilas is much lighter than either of the 2 holos, and has a significantly weaker holo flame. 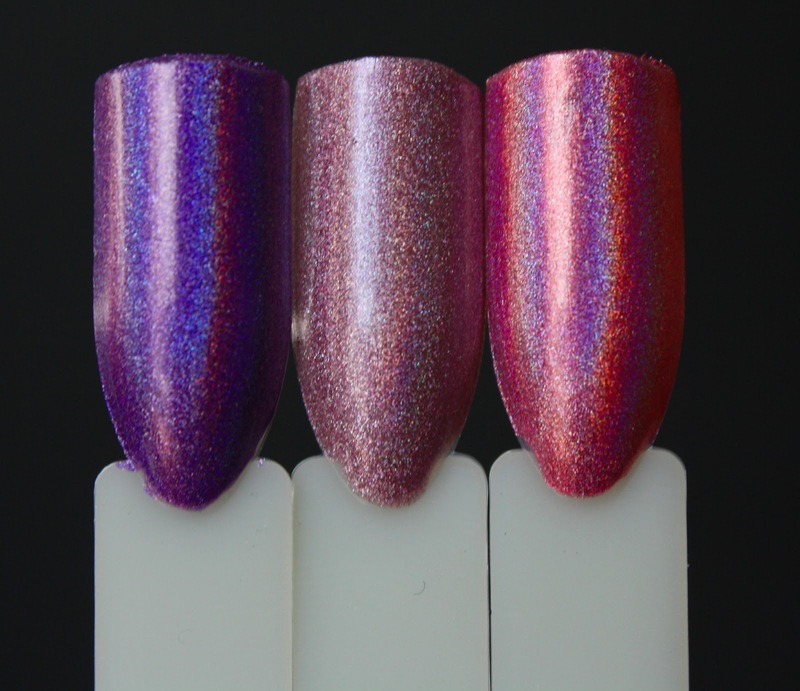 Shown is Eternal Beauty on the left, Laser Lilas in the middle, and Miss Bliss on the right. The first photo is in indirect sun, and the following are in direct sun. So I hope these comparisons were helpful to you, and if they weren't at least you got to see some holo goodness. Have you got your hands on the latest Color Clubs? I love posts like this, thank you! Ooh great comparison! :D They're so pretty!